. A number of you have asked for a tutorial for the GROCERIES sign I posted a couple days ago. I was a little hesitant because for the most part I NEVER REALLY KNOW WHAT I'M DOING! lol here. Some of you asked if the wooden board was already old. I actually bought this with hubby last spring at the HD to attach lattice to on the bottom of our deck. We never used it and it's been sitting in our garage since then. It is pressure treated wood so it has a bit of a green tint that doesn't show well in the pics. ( I'd like to add that at this point if you feel you need to you can add more paint, stain etc. I added a little of my gray water left in the bowl from mixing to do a soft wash over some places that were unever and it just added to the rustic look of it). I'm hoping you will all try your hand at this as it's a lot of fun and very rewarding. Isn't it great! We'll have to ask Robin how she did it. I love it! 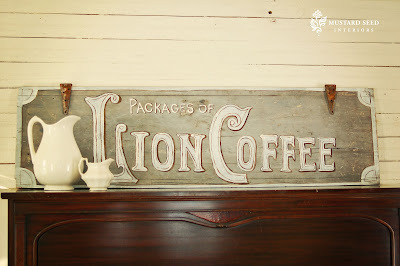 Jaime over at That's My Letter has posted a great tutorial for this lovely sign as well.